At least 11 wildfires are raging inside the Arctic Circle as the hot, dry summer turns an abnormally wide area of Europe into a tinderbox. The worst affected country, Sweden, has called for emergency assistance from its partners in the European Union to help fight the blazes, which have broken out across a wide range of its territory and prompted the evacuations of four communities. Tens of thousands of people have been warned to remain inside and close windows and vents to avoid smoke inhalation. Rail services have been disrupted. The Copernicus Earth observation programme, which gives daily updates of fires in Europe, shows more than 60 fires burning in Sweden. 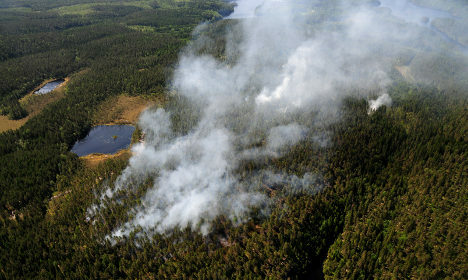 In western Sweden, fire-fighting operations were temporarily halted near an artillery training range near Älvdalen forest due to concerns that unexploded ordnance might be detonated by the extreme heat. Residents in Uppsala said they could see the plumes of smoke and have been banned from barbecuing, after 18 consecutive days without rain. "This is definitely the worst year in recent times for forest fires. Whilst we get them every year, 2018 is shaping up to be excessive," said Mike Peacock, a university researcher and local resident. There have been huge fires in the past in Sweden, but not over such a wide area. Swedish authorities say the risk of more fires in the days ahead is "extremely high" due to temperatures forecast in excess of 30C. The European Forest Fire Information System warned fire danger conditions were likely to be extreme across much of central and northern Europe in the coming weeks. EU officials said many of this year's fires are outside the traditional European fire zone of the Mediterranean, and are increasingly taking place at unexpected times of year. 2017 was the worst fire year in Europe's history, causing destruction to thousands of hectares of forest and cropland in Portugal, Spain and Italy, as late as November. "There are clear trends of longer fire seasons and frequent critical periods in Europe that are leading to dangerous fire situations," said a European commission official. "What we're seeing with this global heatwave is that these areas of fire susceptibility are now broadening, with the moors in north-west England and now these Swedish fires a consequence of that," said Vincent Gauci, professor of global change ecology at the Open University. "Both these areas are typically mild and wet which allows forests and peatlands to develop quite large carbon stores," he added. "When such carbon-dense ecosystems experience aridity and heat and there is a source of ignition - lightning or people - fires will happen."